Once a byword for the economic power of national government - with competition strictly regulated - European commercial aviation has now virtually become a market without state-imposed anticompetitive restrictions. Although intended to enhance competition, this situation has in fact driven airlines to form massive global alliances cartels that offer ever-shrinking benefits to the consumer. In this extraordinarily thorough, blow-by-blow analysis of how this happened ¿ or was allowed to happen ¿ one of the world¿s most eminent aviation law authorities explores the subject with a lucid insight fully informed by historical breadth and a keen appreciation of current pressures. Commercial aviation emerges as the crucible par excellence of the convergence of prevailing global ideology, economics, and international law. the emergence of global megacarriers. The author¿s presentation emphasizes the regulatory constructs that currently affect the European air transport market: pricing and tariffs, pooling of revenue, market access (licensing, capacity limits, traffic rights, slot allocation), ground handlings, cargo services, state aid, and the power of the EU to act on the commercial aviation world stage for Member States. Each of these areas of analysis begins with an overview of the general regulatory environment for that area followed by a detailed chronological delineation of relevant packages, proposals, resolutions, and regulations. 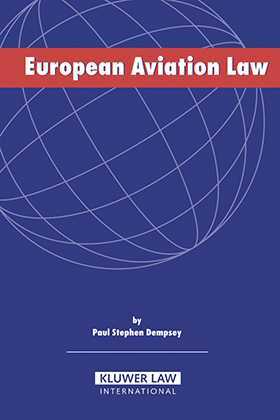 Because of the enormous role played by international air transport with respect to gross national product, employment, and energy consumption, European Aviation Law is of great importance not only to European lawyers but to officials, policymakers, practitioners, and academics in a number of relevant fields worldwide. Table of Contents. I. Introduction. II. The Treaty of Rome. III. Institutions of the European Union and the Development of Air Transport Policy. IV. Jurisdiction of the European Union to Regulate Air Transportation: Decisions of the European Court of Justice. V. Contemporary Air Transport Policy of the European Union. VI. Transatlantic Aviation Alliances. VII. Conclusion. Appendices. Consolidated Version of the Treaty Establishing the European Community. The European Airline Industry: From Single-Market to World-Wide Challenges (European Commission White Paper).